CEF was founded in 2006 with funding from the first round of the Excellence Initiative. As an institution, the Cluster directly reports to the President of the Goethe University Frankfurt. 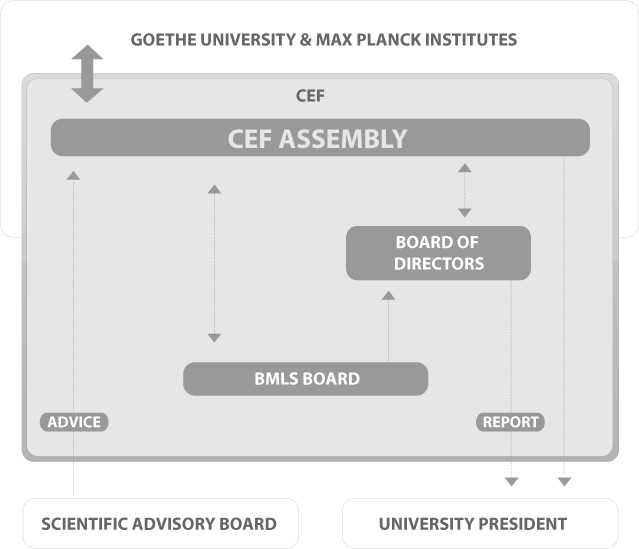 All major decisions are prepared by the CEF Board of Directors in consensus with the international Scientific Advisory Board. Final decisions rest with the CEF Assembly who votes on all important issues. CEF Speaker since 2013 is the chemist Volker Dötsch. During the first five years of funding (CEF-I), the Cluster implemented a two-tier appointment strategy to bring new expertise in complementary research topics to Frankfurt and to support excellent, mostly junior researchers on non-permanent positions in Frankfurt. For investigators newly recruited to Frankfurt, CEF founded and built the Buchmann Institute for Molecular Life Sciences (BMLS), completed in 2011. In addition, calls for application for adjunct investigatorships were advertised annually and Adjunct Investigators selected in a highly competitive process involving external referees receive funding for two years. The Cluster also integrated a small number of outstanding scientists who have reached statutory retirement age as Senior Scientists. In the second funding period (CEF-II, start 2012) the Cluster continues to promote early independence by attracting research groups (non-tenure-track W1 positions) with CEF funds and by integrating research groups with independent funding (e.g. from Emmy Noether, ERC starting grants, Lichtenberg groups) at a similar point in their careers. Almost 60% of the Principal Investigators of CEF-II are new since the CEF-I application in 2006 and half are 45 years old or younger. The CEF administration consists of the Speaker, the Board of Directors and the staff of the CEF Office.